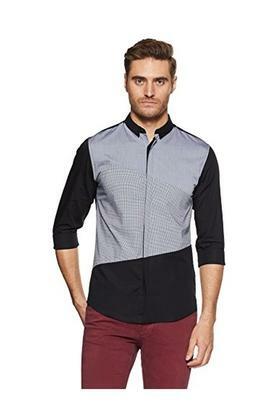 Stay in sync with the current trend by wearing this shirt presented to you by Jack & Jones. It features a slim collar that makes it classy while the colour block pattern accentuates its look. Above all, it has been crafted from good quality fabric, which will provide you with utmost comfort. Complete your casual look by wearing this shirt, which has been crafted with care. You can club it with a pair of chinos and lace up shoes to make a style statement.